Join Me At The Country Loft!! 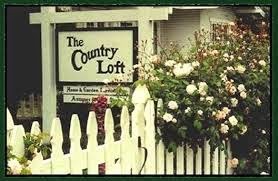 Pinch me again, as very, very lucky me has been invited to spend three days at one of my favorite shops ever....The Country Loft, in LaMesa, CA!!!! Friday, January 16th, I'll be kicking off my Prairie Gathering Quilt of the Quarter at The Country Loft. For those participating in the program through the shop, you will receive a quilt label signed by me for your Prairie Gathering quilt! An little something special just for you!! I will also present a lecture/trunk show from 5 to 8 pm. I'll be bringing stacks and stacks of quilts, with some from each of my Prairie Women's Sewing Circle club, too. my Settler's Puzzle quilt. This quilt is a blast to make! Two very easy unassuming blocks work together to create the stunning quilt center. It goes together like a dream, and we have so much fun in class making this quilt. 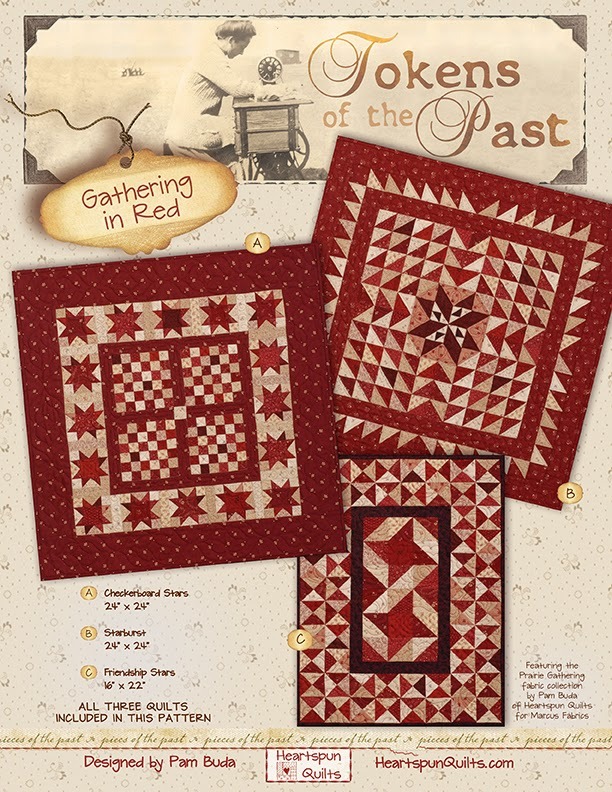 On Sunday, January 18th, for the first time ever, I will be teaching my brand new quilt, Checkerboard Stars, from my Tokens of the Past: Gathering In Red pattern. This quilt is just so much fun to make, and I'll be giving my hints not only for piecing perfection, but for quick and efficient piecing as well. Saving time means more time to make more quilts!! We'd love for you to join the fun! Click here to find out all of the details about my visit, the lecture and workshops offered by The Country Loft! I look forward to seeing you there in January. And, while you're at it, visit their blog, so you can keep up with all that's new and wonderful at The Country Loft. Tomorrow, December 1st, marks the beginning of A Primitive Christmas Handwork Blog Hop, presented by Buttermilk Basin!!!! Finally....I've been waiting ever-so anxiously for this to begin!! Hop on over to see what Cheri Payne has in store for all of us!! Love, love Cheri's prim style!! Click here to visit Cheri's blog. We have something wonderful in store for you every day for the next two weeks!! Click here to see the entire schedule and all of the participating designers. December 9th is my day. Have fun!! Tokens of the Past: Gathering In Red Special Offer!! 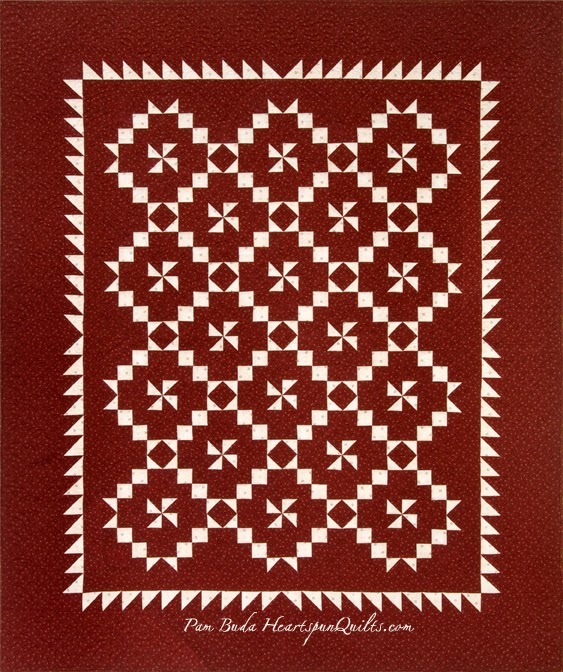 Right after fall quilt market, I introduced the first pattern in my new Tokens of the Past series, called Gathering In Red. I'm so happy to say that this pattern has been very well received. You may remember that I made all of the units and blocks for all three quilts from just one of the brand new Prairie Gathering 10" precut squares! Add the borders and binding and your done! How's that for easy, breezy?? Gotta love simple patchwork like the Checkerboard blocks that make up the center of this quilt. Had to add the star block border....who doesn't love stars anyway? They're always a welcome addition to any quilt, and I named it Checkerboard Stars. Why call it anything else? This quilt measures 24" x 24". 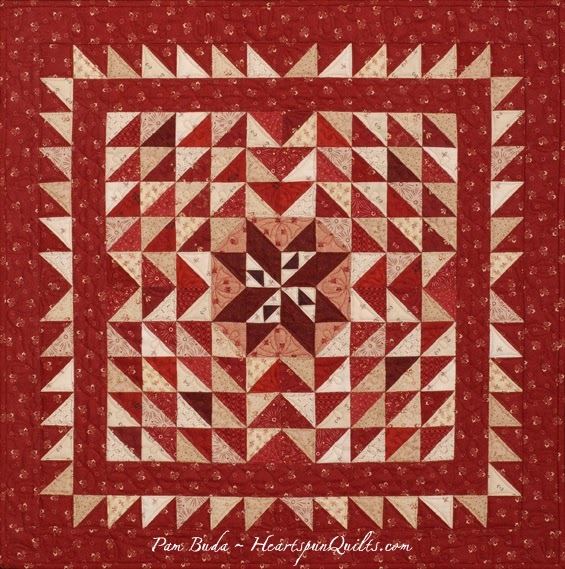 I wanted to feature that pretty medium red fabric, and put is smack dab in the center of the star block for this quilt, and it seems to radiate in a burst of color from the center star. And, so I named this quilt, Starburst. This quilt measures 24" x 24". I wanted a simple table runner that had a lot of movement to it, and this quilt, simply called, Friendship Stars, certainly has that. The full range of creams and reds are perfectly set off by the deepest red border for a stunning presentation. This quilt measures 22" x 16". The Prairie Gathering precut features forty 10" x 10" squares, two each of twenty prints I selected myself. Look for the Prairie Gathering precut at your local shop in February, 2015! As we are about to give thanks for the blessings in our lives, I'd like to extend a special offer to you....a little something to show my gratitude, and thank you for your business, for reading my blog, for your comments, and friendship. The Prairie Gathering 10" precuts are available for a very limited time, in limited quantities. Because of this, it's best to pre-order yours to be certain you'll have one. 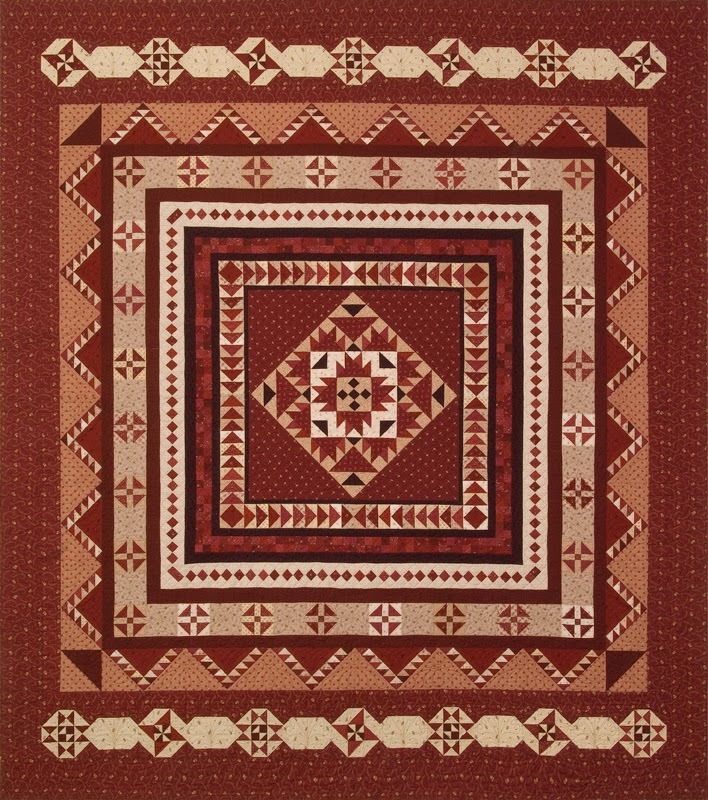 You can order just the Prairie Gathering precut, OR order the Gathering In Red pattern and the precut, OR order the complete set of the Gathering in Red pattern, the precut and all of the borders and bindings to make all three quilts....and you'll get FREE SHIPPING for your order!! 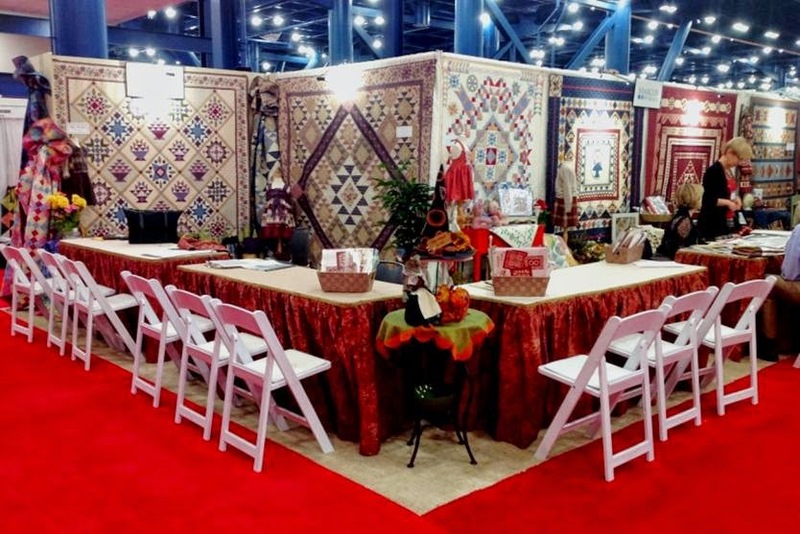 Obviously, red and white quilts are still all the rage as seen in this stunning exhibit at Fall Quilt Market in Houston. Be still my heart! And...as an additional bonus, with each order, I'll also include the pattern for my Prairie Dresden Pincushion! Another FREEBIE!! 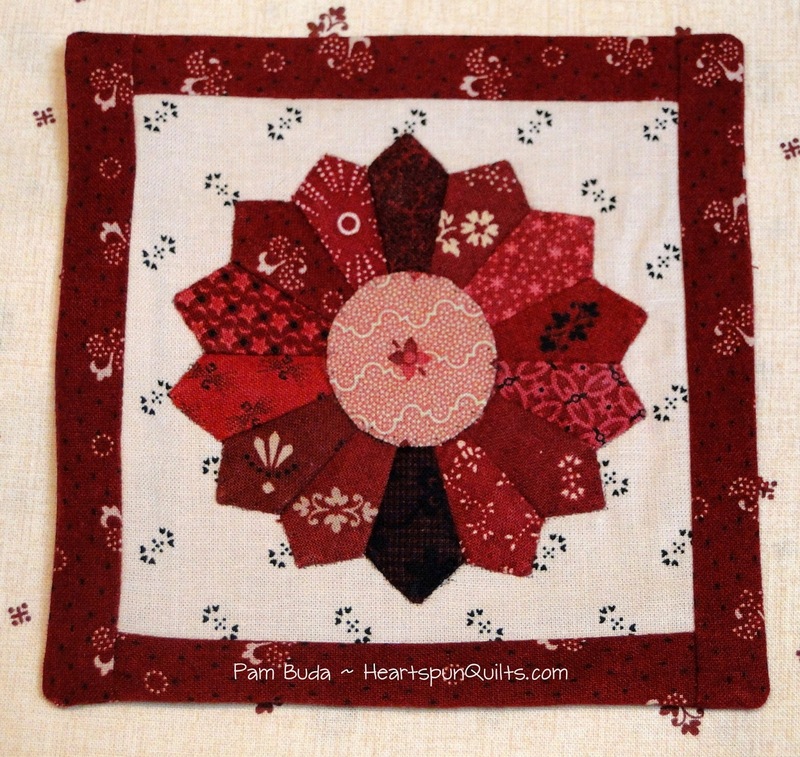 You can use the scraps from making your quilts to make the pincushion, or two, or three! So, visit my website to place your order. Order by December 22nd and you'll get free shipping within the U.S. International orders will receive a $9 credit toward shipping. All orders will ship as soon as the precuts arrive, sometime in February, 2015, when a wonderful package will arrive at your doorstep. In my last post, I wrote about what the term "treenware" means, and since it's items made from wood, and wood is brown, I thought it was a fun nineteenth century name for this line. There are some reds in the line as well, hence the berries. Here are all the fabrics in the collection! The print above is the main print in the line. I hesitated to even show it to you because the photo is so bad. The colors don't look anything like the real fabric, which is a warm and beautiful brown. This print is adorable and I'm so excited about it! I'm still putting the finishing touches on the quilt designed for this collection. Watch for more news on Treenware & Berries, coming soon. 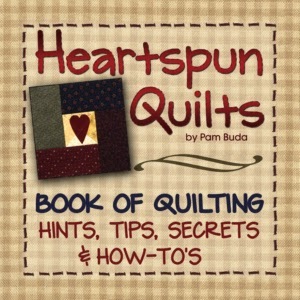 It will be shown to your local quilt shop owner in January, and fabric will be in the shops March or April of 2015!! 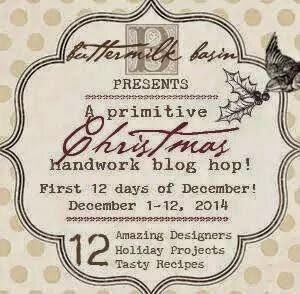 ....our Primitive Christmas Handwork Blog Hop begins!! 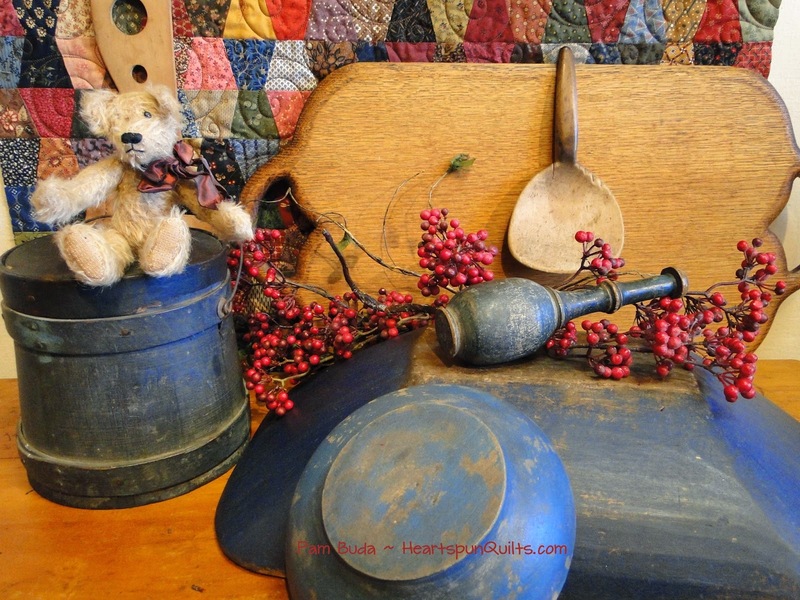 Be sure to visit Cheri Payne's blog, Quilts By Cheri, as she kicks off our designer holiday celebration. I invite you to return right here on Dec 9th when I post my project. This is gonna be so fun!!!!!!!!!!!! Before I start showing you the new fabrics in this collection, perhaps a little history is needed on what the term "treenware" is all about. The photo above shows a sample of some of the early American treenware I've collected. Basically, treenware is (an umbrella term for) any household item that was made, carved, or whittled from wood...in essence from a "tree". Think...household items made from a tree. 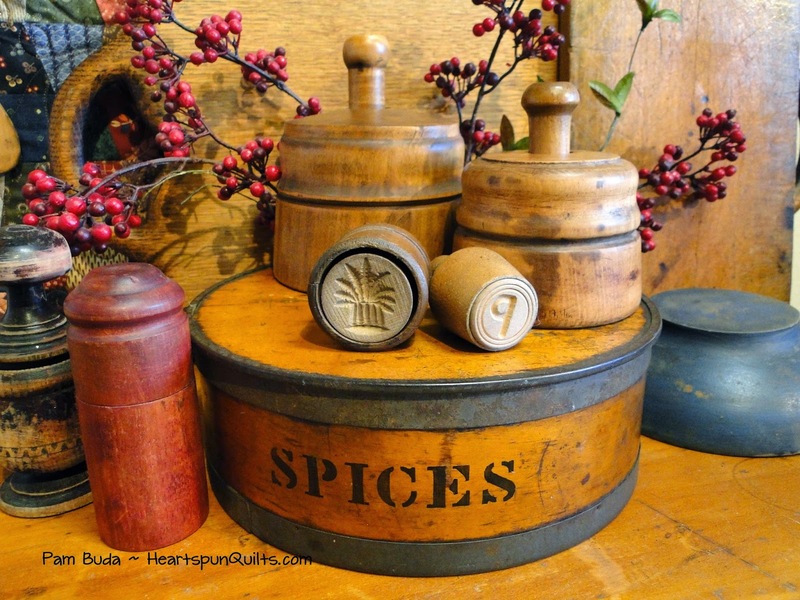 Early American treenware is plentiful and easily found in antique shops. Some items very affordable, and some much more expensive. Most common are cutting boards, both plain and fancy, spoons, ladles, paddles, butter presses, bowls, plates, dough bowls, rolling pins, highly sought after noodle boards, graters, and innumerable kitchen utensils. Treenware items were put to hard work. They weren't meant to sit on a shelf looking pretty. They were put to good use everyday. While most are very plain and utilitarian in design, sometimes their maker put a little extra creative spin in the design. These butter molds, for instance, do have a specific purpose. The size of the mold pressed a specific weight of butter, while the pressed design marked the brand, if you will, of the butter maker. Each one hand carved.... a work of art. What luck it was to find a mini butter press with my initial! 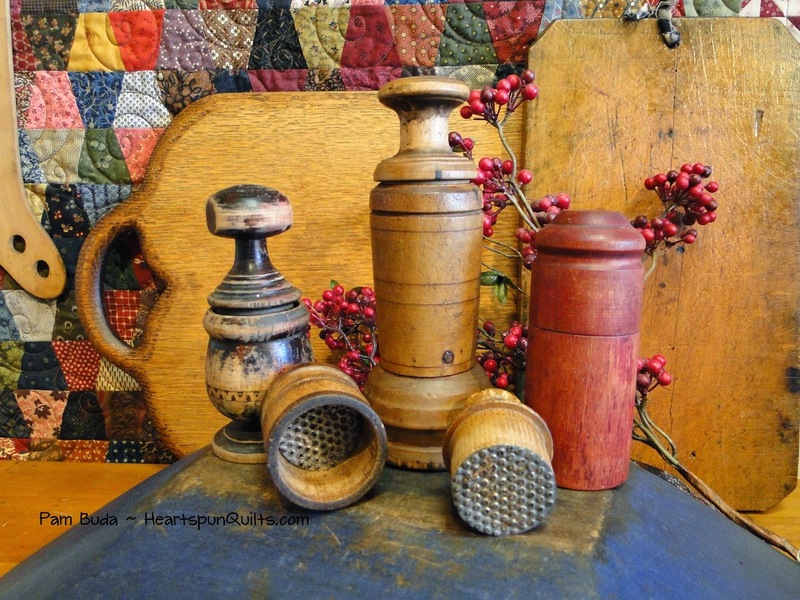 Here are a few of my antique graters, all treen, and some with original paint. Each one hand made. As you can see, the red one doesn't have much in the way of design (you know me with the color red, AND original paint!! Swoon! ), but the black one, albeit quite worn, shows so much character and design, and was obviously worn and loved. The most highly prized (highly priced!) 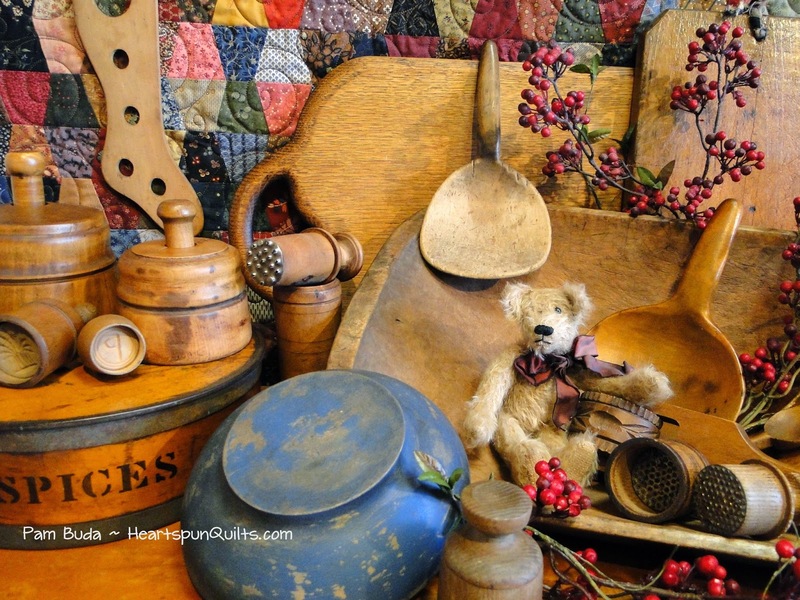 and collectible are treen items in original paint. I love most all of the original paint colors you commonly see which are whitewash or cream, blue, red, green, black and mustard. My wallet doesn't often allow adding to the 'original paint' collection! You know how that is! So now that you know what treenware is....why use that name for the fabric collection? Well....I love using terms from the nineteenth century, and this collection has lovely, warm browns, a few reds, and luscious creams. Basically brown and red.....Treenware and Berries! 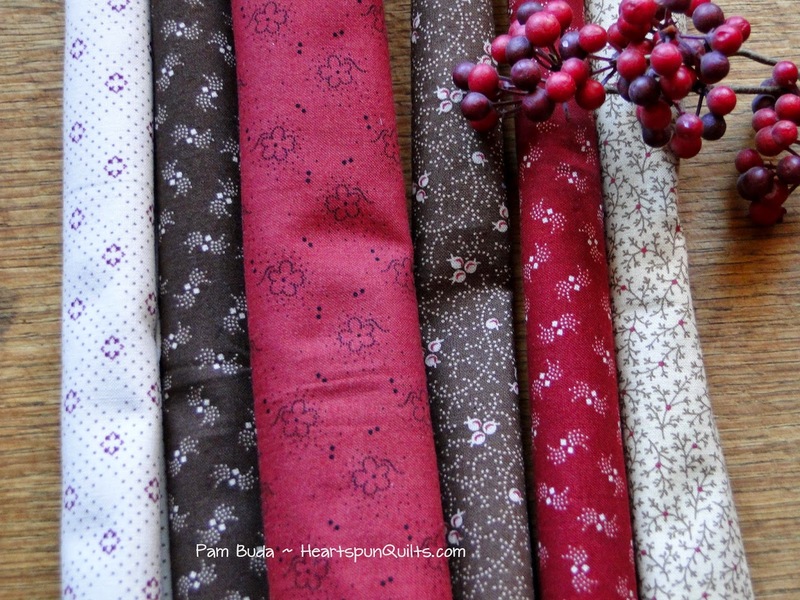 Here's a little sneek peak at a few of the fabrics in the Treenware & Berries collection. I'll show you the entire line in my next post! Have a good weekend!! 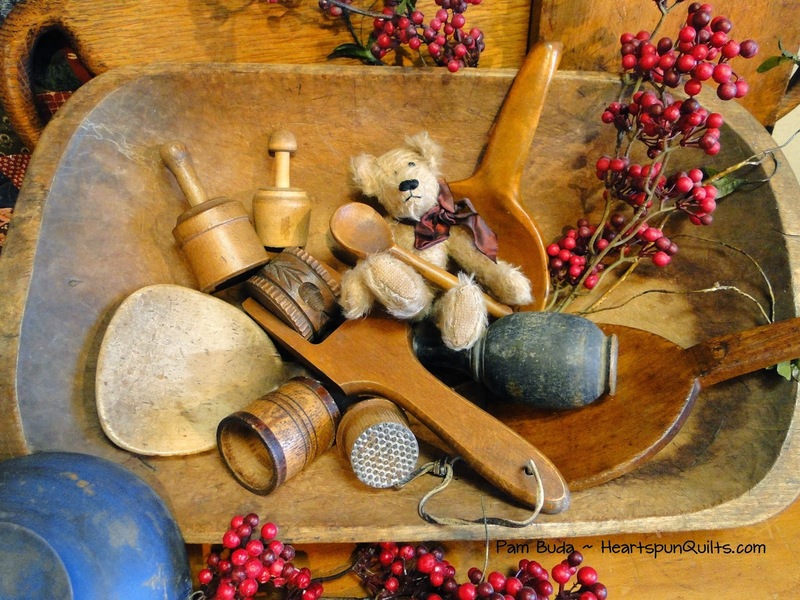 A Primitive Christmas Blog Hop!! I don't know about you, but this unwelcome Polar Vortex that has returned (UGH! ), and submerged most of the U.S. in cold, winter weather. That chill in the air has worked to get me feeling like the holidays are coming soon. Each of us will be offering a new holiday project for your stitching pleasure, along with a favorite holiday recipe (those tried and true...."everyone looks forward to it" treats) for you to enjoy. How much fun is that??? Oh, yeah! Here's the line up of your favorite designers, and the dates to visit their blogs. And, that's not all! There will be give-aways, too!! Oohh...I can hardly wait!! Dec 15 * BONUS SURPRISE!!! Stay tuned!! So, plan on spending a few minutes each day, beginning December 1st, with your favorite beverage, your computer or iPad, and your favorite prim/folk art designers for a little something special just for you. It's our way of saying "thanks! ", and giving back to all of you who give so much to us through the year!! Prairie Gathering Bundles and Loads of New Notions!! Bolts of my new fabric collection, Prairie Gathering, arrived on my doorstep last week, and we got busy right away cutting bunches of Fat Quarter and Fat Eighth bundles!! They're ready to ship today!! Yay! Click on the link above to see all of the prints in the collection. Click here to order a bundle for yourself. When I'm piecing, as often as is possible, I make my unit/block larger than needed so I can trim them to perfection. You just can't beat the results!! While there are a lot of different trimming rulers out there (validating the wonders of trimming!) to try, these are the trimming rulers I feel are easiest to use, easy to read, and offer the best results. In the past, I would only offer them when I did workshops, but since I usually run out, quilters have asked me to stock them on my website. 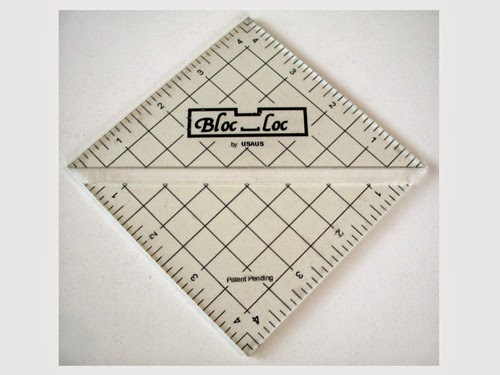 For trimming Half Square Triangles, the Bloc-Loc ruler is the bee's knees!! The channel you see that runs horizontally across the ruler accommodates the seam allowance so your ruler can't rock back and forth. It can't slip, so there's no cutting mistakes. The measurement lines are easy to see, and you can trim two sides of the unit before re-positioning. This is the 4.5 inch trimming ruler. ...and a combo pack containing the 2.5, 4.5 and 6.5 inch trimming rulers! 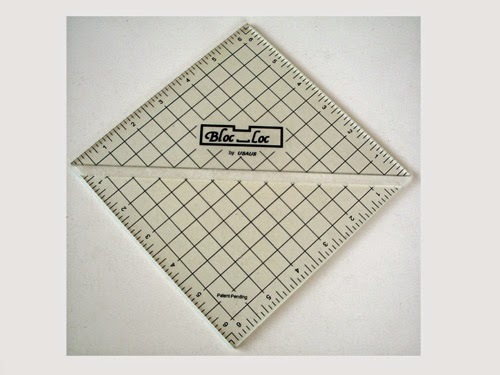 This ruler, the June Tailor Half Square and Quarter Square Triangle trimmer is THE BEST for trimming Quarter Square Triangles, in my humble opinion! X marks the spot! Just lay the black X on top of the QST seam allowances, and trim two sides of the unit. Rotate a quarter turn, lay the X on the seams, and trim again. Perfect QST every time!! Ruler can trim QST from 1.5 to 6.5 inches. I love Deb Tuckers rulers, and the Wing Clipper is pure magic for Flying Geese units. Never struggle again with points cut off of your Flying Geese! 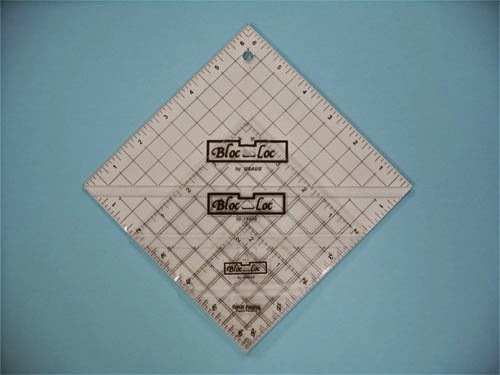 This ruler will trim Flying Geese from 1" x 1.5" to 5.5" x 10". 1" x 1" to 6" x 6". It's a must have! And lastly, this isn't a ruler, but a real handy, dandy thing to have! It's a 6" x 6" folded Magic Mirror by Marti Michell. It's so great to use to audition how a fabric will look when fussy cutting it for five and six pointed stars, and for the ever popular Lucy Boston blocks! fabric prep on through quilt labels. It also has an entire section dedicated to "Making It Larger ~ Trimming It Down", with tables, in 1/8th inch increments, telling you what size you'll need to cut your fabric, to make your Half Square & Quarter Square Triangles larger and trim them to perfection! I've done all the math for you!! Click here to order any and all of the trimming rulers and the Magic Mirror. And with all that good stuff to aid you in your piecing adventures, you're sure to have perfect results!! 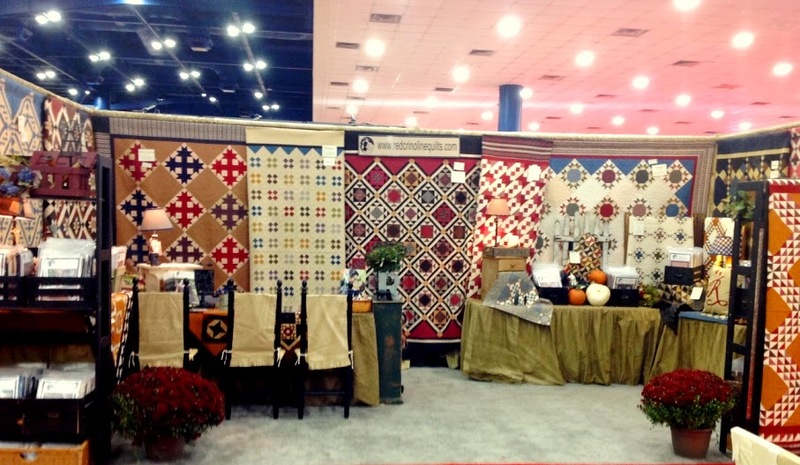 Attending Fall Market in Houston was a wonderful, relaxing experience. Because I didn't have a booth, I was able to spend five days submerging myself in all things quilting and had time for visiting with friends I don't often get to see. My Prairie Gathering Quilt-of-the-Quarter quilt hung in the center of the Marcus Fabrics booth along with other outstanding quilt projects that will soon be coming your way! 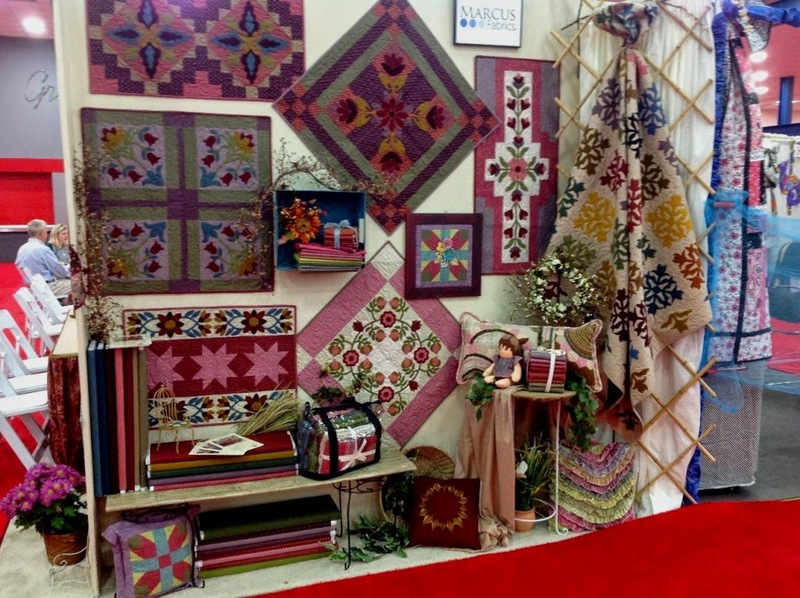 My brand new Tokens of the Past: Gathering In Red series quilts made their debut at market, and I'm so very happy to say, were met with rave reviews!! 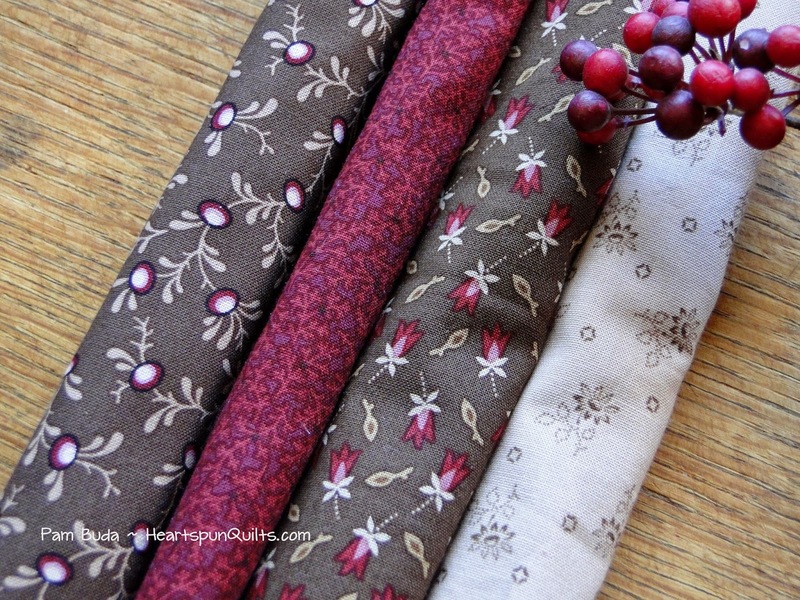 Also in the Marcus Fabrics family is Mill Works by Nancy Rink Designs. A new BOM. 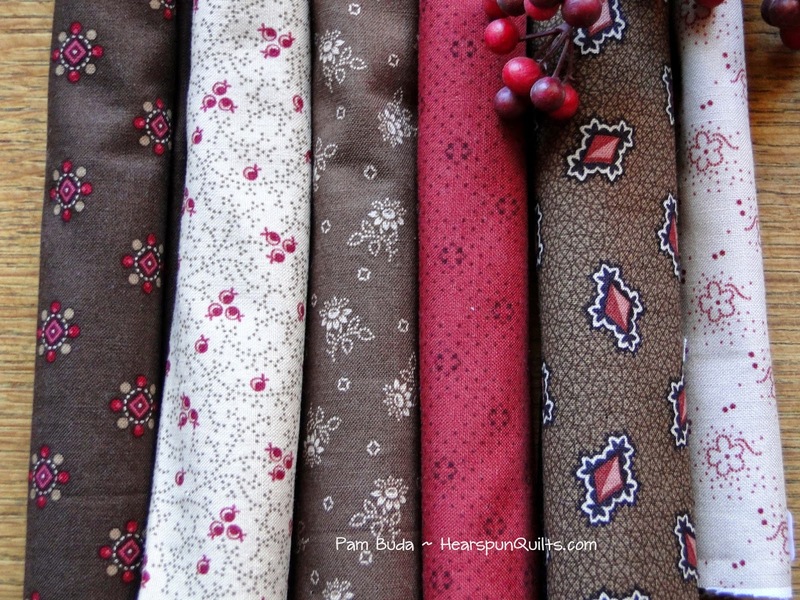 Well, The Quilted Crows sent a bevy of new projects for their new Pantry Club. Missed you L & D, and your awesome quilts and projects made for a whole lot of eye candy in the aisle!! Red Crinoline's booth was just across the aisle from Marcus. Paula Barnes and Mary Ellen Robison had lots of new quilts. These are just some of their new pattern offerings. If I had a favorite, it would be this quilt, Bonnie Blue, because I just love me a two color quilt!! As I roamed the market aisles, I found quite a few friends and their gorgeous designs! This is Joyce's new wool BOM...just loving the textures in all that wool!! Had to buy the pattern for this small quilt called Weezer's Paws. Always have to stop and see Kathy Cardiff of The Cottage at Cardiff Farms. Her wool designs really speak to me. They say 'buy me, make me!" ...that get me every time!! Both of Kathy's pinkeep books came home with me! Annemarie Yohnk of Quilts Remembered always, always has quilts that touch my heart. No visit to market would ever be complete without stopping at my pal Lynne Hagmeier's (Kansas Troubles Quilters) booth. 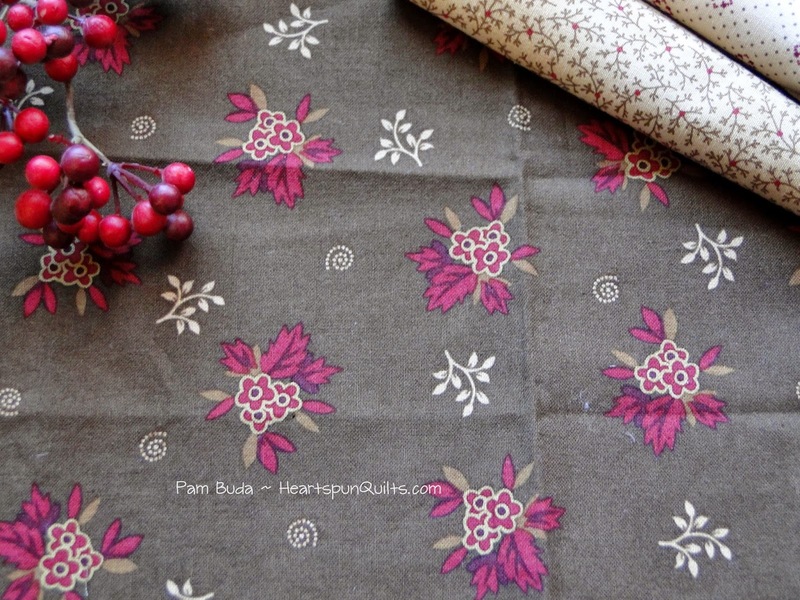 We all got our first look at Lynne's newest fabric collection, Clara's Garden. Clara was Lynne's great, great-grandmother, and she has quite a story. 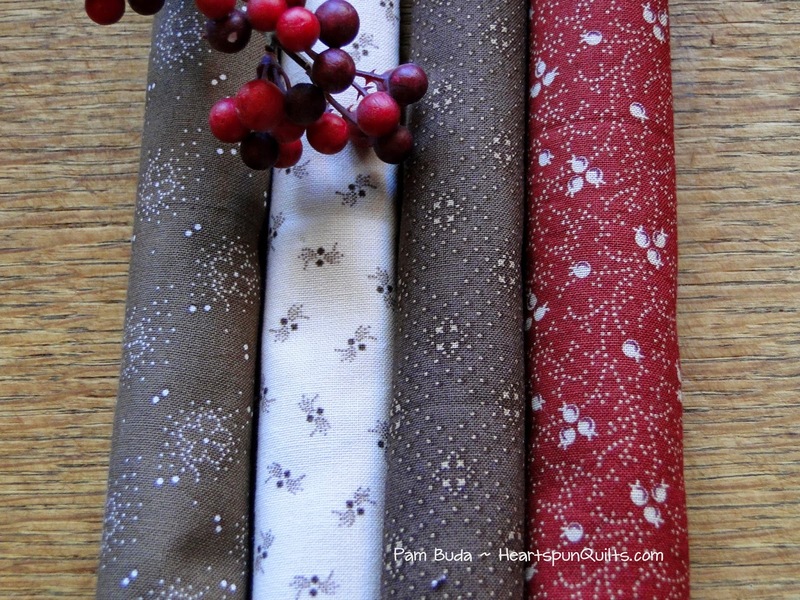 Click here to learn more about Clara and Lynne's fabric line. Lynne never fails to WOW me with how many different quilts she creates from her 'layered patchwork' technique. Isn't this just awesome?? One of my favorite quilts to see at Market was Di Ford's mystery quilt for Quiltmania magazine. It was just jaw dropping-ly beautiful!!! I was thrilled that Di chose to use so many of my fabrics in her quilt, and as I stood there, I got goosies just looking at them. Actually, there are many, many Marcus fabrics in her quilt, including fabrics from Judie Rothermel, Paula Barnes, and Molly B's. Every market has a large exhibit of quilts. I usually don't have time to peruse them as I'm always in the booth, but this time, I had time to wander. As you can imagine, this exhibit was a show stopper. 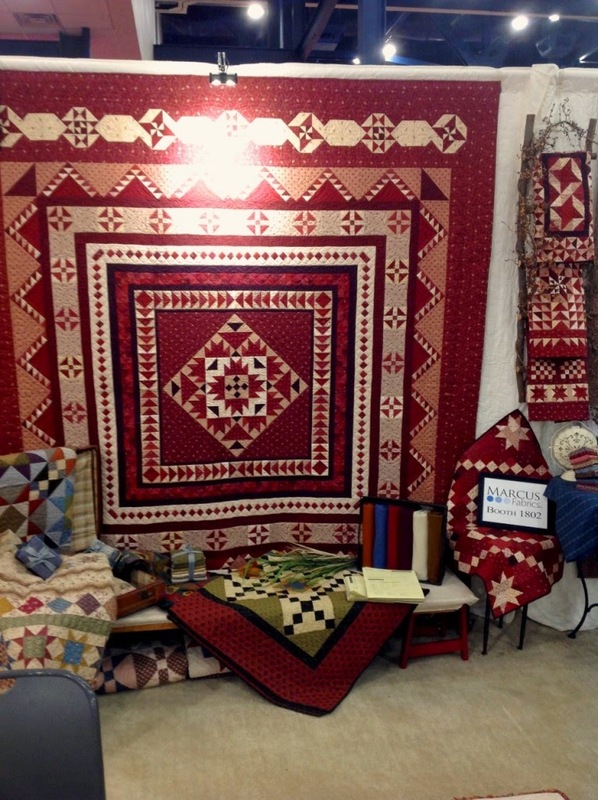 Much like the Infinite Variety show in New York City a few years ago, this display of red and white quilts had everyone talking. What is it about red and white quilts that draws us all so much? They're vibrant, striking, colorful, and happy.... but maybe that's just me? 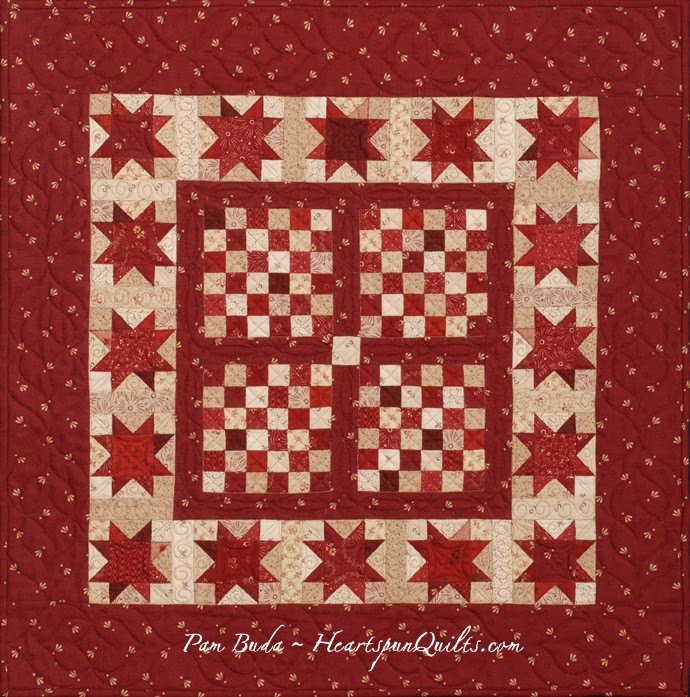 Do you like red and white quilts, too? Perhaps you're working on a collection of your own? 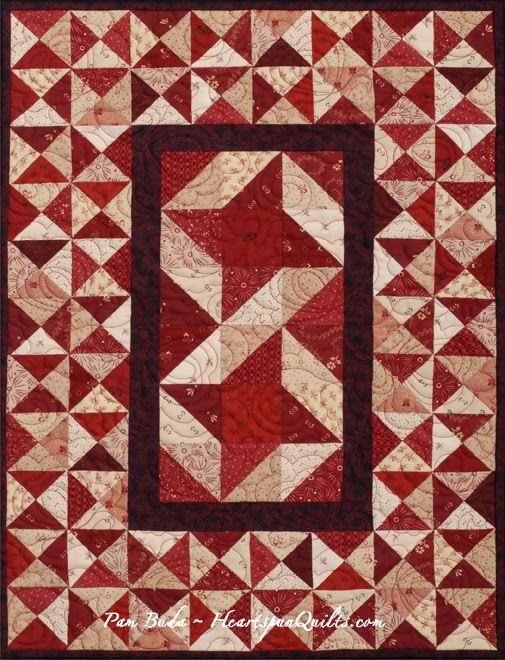 May I suggest a few new red quilts for your collection? Shameless, I know, but you can't blame a girl for trying! I hope you found a few things in these market pictures that are speaking to you. Thanks so much for visiting my blog today!